Chocolate again today! In fact, we're making candy bars at the Humble household. Over the last year I've noticed an increasing number of custom candy bars being offered online. Candy makers have finally put a choke hold on chocolate lovers by offering to craft their ultimate, personal chocolate bar. Who can resist that? Chocolate, any way YOU want it. To think, for so many years I raged at the world for denying my cravings for chocolate with chili and gummy bears. Now the retail market is finally reaching out to me and my bizarre cravings. Of course, making personalized chocolate bars is something that we've had the ability to do for ages. It doesn't require a lot of specialized equipment, just a little time, a lot of chocolate and a dash of know-how. Really, the only tool you will need is a chocolate bar mold. I have a single large break-apart chocolate bar mold that I use for my candy-bar making. They're cheap--a couple dollars--and will give your candy a nice professional look. Occasionally though, you'll hit on something that has a little appeal… like a s'mores candy bar. The first thing you need to do when making candy bars is temper the chocolate. This is where the science comes in. When you buy a good quality bar of chocolate or a molded chocolate from a candy shop you'll notice it has a nice hard, glossy finish and will break with a clean snap. Tempering is the process that creates this finish. Without it, you'll have a whole host of problems: The chocolate may never set up at room temperature. It may become hard but will look dull and blotchy. You can have blooms of fats and sugar on the surface of the candy. Worst of all, the chocolate might not pop out of your mold. To prevent this you need to coax the cocoa fats into a specific structure that stabilizes the chocolate. This is done by regulating the chocolate's temperature and rather than write endlessly on how to do this, I'm going to post a video and then go do some laundry. Blogger cop-out for sure, but hey... I don't have any clean towels. So, once you have your bowl of tempered chocolate you're ready to start candy making. The easiest method of making custom candy bars is to fill the mold 3/4's full and then poke any dried fruits, nuts, confections, cookies, cereals etc into the wet chocolate and allow to set. So if this method of making the candy bars seems a little overwhelming or bothersome, you can still jab mini marshmallows and graham cracker chunks into the chocolate to make a simplified version of this candy bar. Ladle in the tempered chocolate and fill the mold. Grab a chef knife or large spatula (the sort you use to frost cakes) Turn the mold over the bowl and tap the back of the mold with the back of your chef's knife to remove the excess chocolate. This will create a hollow chocolate shell to contain all the s'more goodness. Allow the remaining chocolate in the mold to set until firm and glossy. Allow the marshmallow cream to cool completely before the next step. Spread a layer of cream into your set chocolate mold. Press a single layer of graham crackers down onto the cream. Pour a layer of tempered chocolate on top to seal the candy bar. Tap the bar on the counter to release any air bubbles and then scrape off the excess with the back of a chef's knife. Allow the chocolate to set completely before un-molding. Breaking and eating. Genius!!!! I love the idea of toasting the marshmallow fluff - it just isn't the same without that flavor. this is just plain awesome! love it! Wow, beautiful pictures! This recipe looks delicious, definitely going to try it sometime!! Thanks for sharing! Ms. Humble, the video refuses to load, it starts and then skips instantly to the end, very odd. This sounds wonderful, I may have to buy a chocolate mold! Odd... it still works fine for me. Is anyone else having trouble with the video? This is fantastic! I don't know what it is about s'mores, but I just can't seem to get enough of them. These bars are definitely a must-try for me! They look amazing. I cant wait to try them. These look so delicious! And that video made the tempering process seem a lot less scary. I didn't have any marshmallow cream, so I will be purchasing some ASAP to try out this amazing and simple recipe, but I used peanut butter and heath chips instead, and it was delicious! Thank you for the inspiration! Oh-- and I did not have candy molds either, but a ceramic pan worked amazingly well! Thanks for the Chef recommendation. I love, love, love British comedy. I'll ask Mr. Humble to get it for me this weekend. Oh My. You've hit a home run again Ms. Humble. One of my favorite combos and it looks great. Thanks for all the tips! All I can say is WOW!!! Just WOW!!!! More chocolate? Why must you tease me so? Jacques Torres is my idol, and your s'more candy bar is a really cool idea. I'm going to finally get a blow torch. And, British comedies are the best. I am not worthy of typing here because you are AMAZING. I love what you did here, and I'm not even crazy about s'mores. Goodness. I'm in awe. I've been wanting to make some more chocolates, and this post has encouraged me to make more. Thank you for this great post and lovely photos. Ooooh, that looks so pretty! SHINY. I've never had a Smores. They just aren't part of the culture here, I don't think. Sounds very tasty though! What is marshmallow fluff/can you get it overseas? out of this world awesome! very portable! 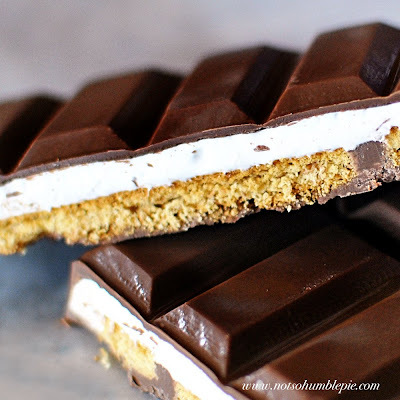 Wonderful and creative use for a simple candy bar mold. Toasting and stirring the marshmallow cream is brilliant - that toasted flavor is always what's missing when doing indoor s'mores take-offs. Can't wait to try this, thanks for sharing! Are you kidding me??!!! This is super awesome!!! btw, how long can you store it? I would keep the bars chilled until the day you plan on eating them. I'm always worried about homemade filled chocolates and truffles as hey can spoil. Better safe than sorry, so yea, I'd keep them cool. And when did you say you'd start selling these on Etsy??? I am drooling and I LOVE anything S'more.... yum. These look fantastic! and to think I have been having my chemistry students make these with bunsen burners. Now I have to go get the bar mold. I had the same video problem as Josephine. But your creation looks so amazing and delicious! 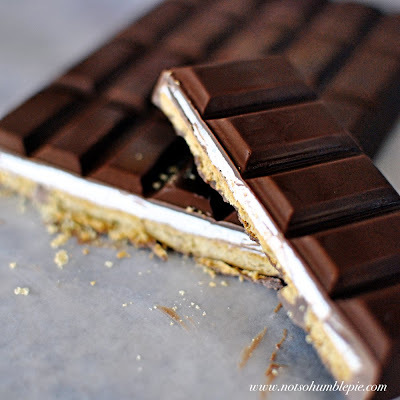 I make some s'mores bars that are essentially a lazy person's version of your lovely bar. FYI, you aren't coaxing the sugar crystals into the proper structure, but rather the fat i.e. cocoa butter in the chocolate. There are 6 types of molecules that each have a different melting point which is why you have to get the chocolate to a certain temperature for the proper crystalline structure to form to have chocolate that is in temper. Sorry, I get a bit picky about food science stuffs. oh my gosh! I can't believe you made this! sooo impressive! one of the finest blog ever and thanks for that. Hey, that looks like something that I could actually attempt to make. Gunna have to try this asap! I made these over the weekend and they were a major hit! Thanks for the idea! What an absolutely *#%&@%! awesome idea! Me gusta! This could become a favorite. That photo is so appealing. When I wrote my comment for the CSN, I did not mention that My Sweet and Savory and Comfy Cook is the same person. On Facebook, I follow you but everything else is under My Sweet and Savory. Sorry about this. NO WAY!!!! OMG!!!!! I just made smores cupcakes!! :) and I was going to try out another smores cupcake recipe that I worked out..but NOW...Now I see these delicious looking bars and I think I JUST Might have to find a way to make these!!! I'm afraid this post has unleashed my inner chocolate monster. And that monster is clawing at the screen to get hold of that s'mores candy bar. And will soon be scuttling off to go buy a chocolate bar mold. Wow - I LOVE it. That may be the most appetizing candy bar I have ever seen! Looks delicious and I have a funny feeling I'm going to have a terrible craving for Smores for a while! These look so delicious !!!! I am dying. sell them? I haven't quite figured out the whole "tempering" chocolate thing. How on earth does one wait for them to set? Looks really good. I've have to try them. Do sell any of them? this is insane. you should market them! I don't think I could help myself from snacking on the bars should I try to make them for others. I think it is best for my waistline that I avoid mass-producing chocolate bars. Wow! totally mouth watering, and I'm in love with chocolates. This one is homemade and can be personalized. love it! I am sooo glad I found your blog! You are heaven sent!!! I love the macaron 101, and I definitely love this idea! My gran is turning 80 in a couple of weeks and my aunt is organizing a surprise birthday party. They asked me to make the party favours and I think I'm going to use your idea! For those who do not have access to marshmallow fluff, it is essentially marshmallow. To get the cream consistency I suggest slightly warming marshmallows until they get gooey. This can be done in a microwave if watched carefully. About 15 seconds depending on your microwave. Toast and proceed! Wow, this looks SO delicious! I love s'mores.